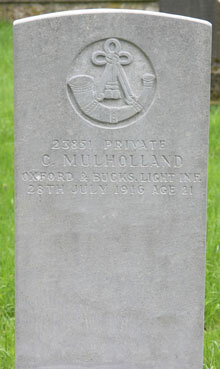 Charles Mulholland was the son of Robert and Margaret Mulholland. He was born on born 12th January 1893 in Cookstown. They were a farming family who lived at Mackney, Orritor, Cookstown. He serving his time in the grocery business with Joseph Stewart who had a shop in James Street. He joined the Royal Irish Fusiliers. He went out to India with his battalion. He was attached to the Army Cyclist Corps for a time. 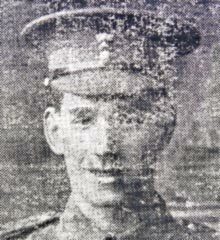 Private Charles Mulholland was serving with the 5th Battalion of the Oxford and Buckinghamshire Light Infantry when he contracted pericarditis and died on 28th July 1916.